Well, I guess I'm officially old. Jagr, who made his debut the month Germany was unified and the first web server was launched, has played his last NHL game (or so we assume). It was a real honour to write an article for NHL.com that included five interesting stats about his amazing career, including the fact that "Only 15.0 percent of active NHL players (145 of 967) have as many points in their entire career as Jagr has since turning 40." 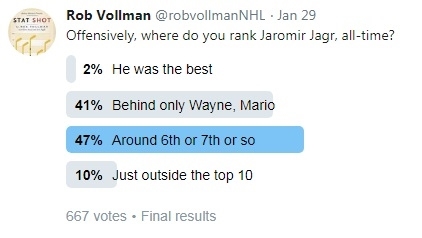 This wasn't in the article, but I since checked and confirmed that Jagr led his team in scoring 13 times, which is tied with Sundin for 2nd (since 1967), behind only the Great One, 19 times. Offensively, it appears that his place in history is somewhere between third and seventh, and I can't say that I would argue with that assessment. This week, my article for ESPN Insider is about the Canadian and American Olympic teams, which will not include NHLers for the first time since professional hockey players were allowed to compete back in 1998. The average fan is pretty jaded about how competitive these teams will be. 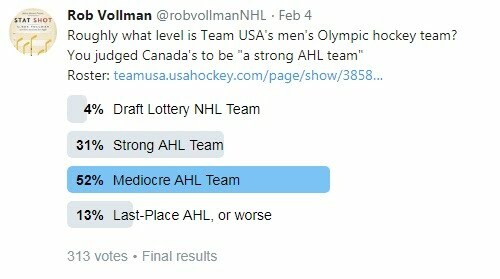 Most fans see Team Canada as a strong AHL teams, and Team USA as a mediocre one. I can't completely disagree with those assessments. As I explored in more detail in the ESPN piece, each team should be ok offensively, but are seriously lacking defense, penalty killing, and goaltending. 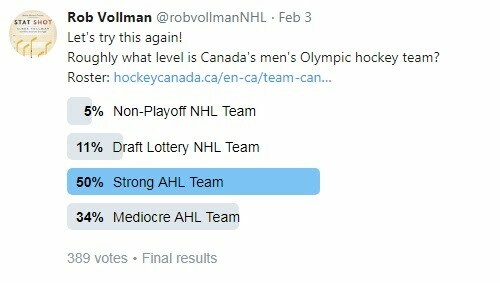 However, I still think that Team Canada wouldn't be completely out of place in the NHL. They might find themselves in the draft lottery, but they'd essentially fit in. For no pressing reason, I wanted to see what the general feeling was about Horvat's contract. In a summer piece for ESPN, I identified Horvat's as one of the better contracts of the summer. However, when I re-ran my model using the version of WAR found on Corsica Hockey, it actually seemed like a very bad contract. That's the sort of thing that piques my interest. To get to the bottom of it, I usually like to start by figuring out what the conventional wisdom is. Turns out, his contract is viewed to be about right. 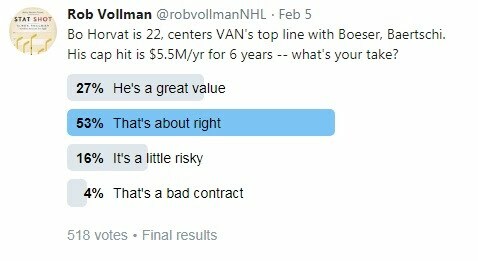 Perhaps Horvat deserves some of the credit for Boeser's success right out of the gate? You'll probably see me digging deeper into this question in the near future, so if you have some insight one way or the other, be sure to reach out to me and let me know. Someone born in 1922 had to wait until age 78 to see the Canadiens miss the playoffs eight times. There are 19-year-olds who may witness that this year. There are four teams with at least five draft picks in the first three rounds of the 2018 draft: Colorado, Detroit, Montreal, and the Islanders. There are three teams with only one, San Jose (a first), Ottawa (a third), and Calgary (a third). However, the specifics of the Duchene trade could get Ottawa its first pick back, in exchange for the one in 2019. Colorado has an amazing 10 players in their lineup on ELCs. That's obviously the most in the league, followed by 8 for Boston and Winnipeg. Given the relative success of those three teams, this appears to be a great way to get value out of your lineup and surprise the pundits. Then again, the next teams are Arizona with seven, followed by Chicago, Edmonton, New Jersey, and Toronto with seven. Seems like the first three teams are doing so out of necessity. At the other end, Minnesota has one, while Nashville, Ottawa, Tampa Bay and Washington have two each.